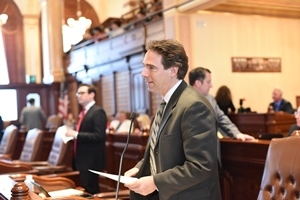 State Senator Steve Stadelman joined with both Republicans and Democrats to pass a fully balanced state budget, which includes almost $15 million in funding Stadelman secured for the Chicago Rockford International Airport. "Senator Stadelman has a been a strong supporter of this airport, and we're very appreciative of the hard work he did to make this appropriation happen," Airport Director Mike Dunn told the Rockford Register Star after both chambers of the Illinois General Assembly approved the state's $38.5 billion spending plan last week. Stadelman called the airport money a long overdue commitment made by former Governor Pat Quinn but frozen by Rauner when he took office in 2015. Rauner's renege forced the airport into an expensive bridge loan to build the $40 million maintenance, repair and overhaul (MRO) facility deemed critical to the airport's continued growth as a Midwest cargo hub. After two years of partisan gridlock that left Illinois operating without a budget and relying on patchwork of court orders, contractual obligations and partial appropriations, Stadelman said he was encouraged to see the 2019 spending plan clear the Senate on 56-2 vote. "It's great to see Republicans and Democrats working together to pass a bipartisan, balanced budget," Stadelman said. "This is how state government should operate." $350 million more for public schools across the state to satisfy requirements of last year's historic education funding reform, which increases support for Rockford, Harlem and other school systems with high concentrations of at-risk students from low-income families. $120 million more for local governments to help prevent property tax increases and layoffs of first responders. In an editorial this week, the Rockford Register Star commended the budget agreement as "especially good news for Rockford." State Senator Steve Stadelman supported two proposals to increase stability for thousands of Illinois families that rely on the Child Care Assistance Program that are now headed to Governor Bruce Rauner's desk. House Bill 4965 would bring Illinois in line with federal law by moving to a 12-month redetermination process for CCAP families instead of the current system, which reassesses eligibility every six months. Illinois Action for Children estimates the state will receive an additional $82.8 million in federal child care funding should it move to a 12-month redetermination process. Stadelman also voted in favor of a separate proposal to maintain current eligibility requirements for CCAP. The plan, contained in House Bill 5599, protects CCAP from drastic cuts at the whim of the governor. The proposal seeks to prevent the near decimation of the program that took place in 2015 under Rauner, who unilaterally reduced eligibility for 90 percent of CCAP participants. Legislators on both sides of the partisan aisle decried the move. More than half a century since the Civil Rights Act became law, U.S. workers continue to earn different wages based upon race. Senator Steve Stadelman suppported state legislation to prohibit wage discrimination against African-Americans under the Equal Pay Act. House Bill 4743 forbids employers from paying wages to an African-American employee at a rate less than the rate paid to an employee who is not African-American for the same or substantially similar work. According to a 2017 Federal Reserve study, black men and women earn persistently lower wages compared to their white counterparts and this wage gap cannot be adequately explained by differences in education, age, job type or location. As part of this weekend's 75th Anniversary celebration for the Rockford Peaches, an exhibition took place today between community members and the Starfires women's baseball team at Beyer Stadium. A great day at the ballpark! Dave Syverson is with Steve Stadelman.